Before he became a blogging superstar, Jon Morrow was struggling. He’d been blogging for a couple of years but he’d hit a brick wall. Actually, it was a glass ceiling. The glass ceiling of the blogosphere. That’s when you reach 100 visitors a day and can’t go any further. Nothing you do makes a blind bit of difference. So he quit what he was doing. And about 6 months later he hired a blogging expert to do a post mortem – examine all his stuff and tell him what he’d been doing wrong. The answer was simple but astounding: “No one knows who you are”. "Yeah, but isn't that the point of publishing great content? You write lots of great stuff, and then the word spreads, and popular bloggers find out about you?" "No," replied the expert. 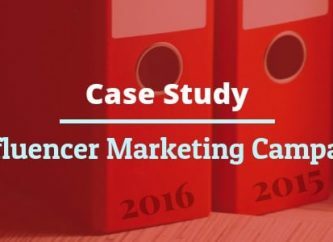 "Popular bloggers find out about who you are, and THEN they read your content, and THEN they link to you. Connections come first. Great content comes second." Great content comes second? Seriously? That was an eye-opener for me and I’m guessing it will be for you too. In a nutshell, you need to get on the radar of the influential bloggers in your niche, form relationships with them, cultivate those relationships, and then let your top quality content do its work. But how exactly do you get on their radar? That’s what I’m going to show you in this article – three kinds of influencer outreach that will get you noticed by Influencers and bring you traffic, backlinks, and authority. Have you ever wondered how bloggers get chummy with the key players in their niche? a) Are Roundups Still Effective? But expert roundups have gotten some bad press recently, in particular from Rand Fishkin. There are certainly a lot of expert roundups floating around the blogosphere, most of them not well done. Unfortunately, there’s a widely held view that with an expert roundup, other people write your post for you. This has led to roundup posts that are nothing more than 20 to 30 expert opinions slapped together with hardly any Introduction and no Conclusion at all. But this is good news! It means it’s a field where you can really shine if you put the work in. In my experience, a good roundup post is far more work than a standard 1500-word article. 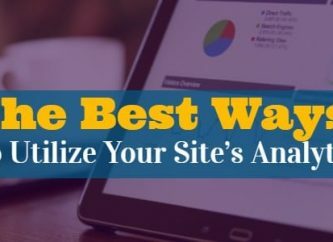 Because the key to a good roundup is taking what the experts have said and summarizing it in a way that gives the reader a valuable overview of the topic. And that’s exactly what’s missing from most roundups. Expert roundups can be a very good format for conveying information, as long as you summarize or synthesize the information provided by the experts. Well, it’s true—roundups perform poorly in this area. But they generate a lot of social shares. And according to SEO expert Brian Honigman, “social shares are the new form of link building”. 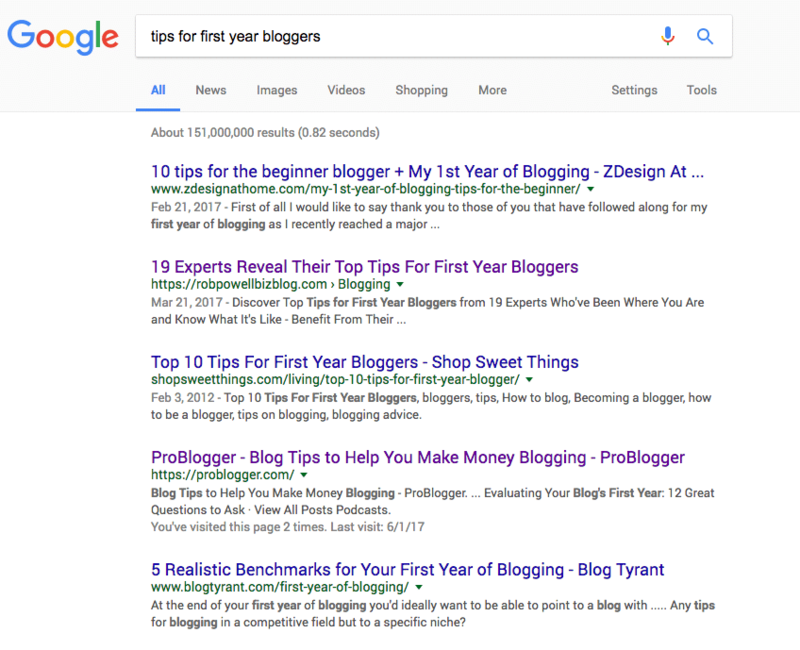 In position #2 is my roundup post – 19 Experts Reveal Their Top Tips For First Year Bloggers. It beats a similar blog post from Blogtyrant titled: ‘5 Realistic Benchmarks for Your First Year of Blogging’. Yet Blogtyrant has been around for much longer than my website and has a Domain Authority of 52, compared with my DA of 21. We both targeted first-year bloggers. How on earth did I manage to rank higher in Google? That’s where roundup posts excel! That’s a lot opportunity for building rapport with Key Influencers in your niche! For a complete guide on how to do it, see my article ‘The Definitive Guide to Writing Roundup Posts That Go Viral’. What if I told you about a technique that uses basic human psychology to get your content shared all over the Internet by people with large followings. This is a strategy I stumbled upon in an article on Income Diary. I was skeptical at first but decided to give it a try. First, the technique, as described by Josh Dunlop. It’s quite simple. Just compile a list of 20 or 30 top Influencers in your niche. The easiest way to do this is simply type into Google your keyword plus “top influencers”. 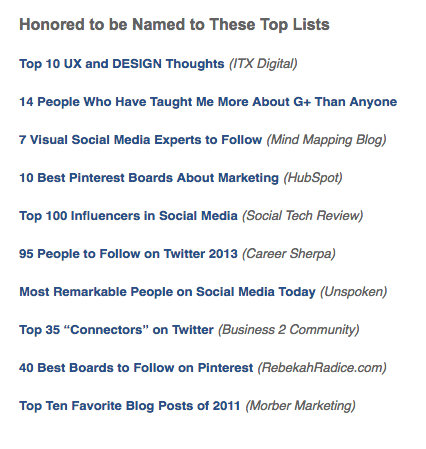 For my article on Pinterest marketers, I typed in Pinterest +”top marketers” (and variations). I found about 5 lists that other people had compiled. Then do a ‘skyscraper’ — if other people have created lists of 10, 15, and 20, you could go for 30 or even 50. Remember: the more Influencers on your list, the more firepower you’ll have in terms of social media shares and backlinks. The title of your top list will usually imply some kind of ranking factor, e.g. most followers, richest, highest monthly web income, etc. If your ranking factor is monthly web income, you’ll need to download their income reports and enter the data into a spreadsheet and then sort it by value. For their article on Top Earning Websites, Income Diary analyzed the SEC 10-K reports submitted by publicly traded companies within 60 days of the company’s fiscal year end. In my case, I simply found the Influencer’s Pinterest page and noted down the number of followers they had. In that case, you just need to make sure that there’s a plausible reason for each of your candidates to be included on your list. For this, you’ll need to look at their ‘About’ page and you may even have to drill down deeper into their website. Once your article is live, send an email to each of the people on your list. All you do in this email is let them know they’re included in the list. Don’t ask them to share the article or for a link or anything else. That will work against you! Remember what I said about human psychology? The whole point of this technique is that the people on your list will want to share your article. An important detail in this template is the last sentence. This technique leverages basic human psychology – we all need and want praise, recognition, and acceptance. As Mark Twain once said: “I can live for two months on a good compliment”. And that’s why this technique is so effective: 30% to 50% of the people on your list will be honored, flattered and excited to be included. What do you think they’ll do with your list? They’re going to share it—on social media. And remember: these people have huge followings! 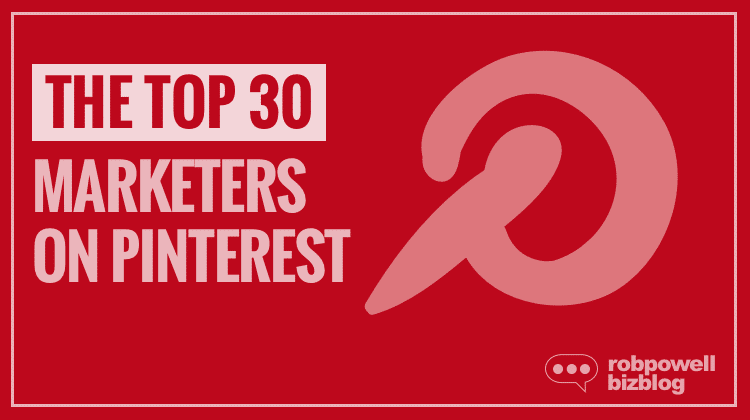 I published my Top Pinterest Marketers List on June 28th, 2017. At the time of writing (July 8th, 2017) the article has collected 197 social media shares! The people on your Top List will also share your article on their website. Influencers who get their names on these lists like to mention it on their ‘About’ page. So you may well pick up some valuable ‘do follow’ links. Me? Interview a big name in my niche? No way! And anyway, why would they agree to be interviewed by someone they’ve never heard of? But do you know the real power of Influencer interviews? Researching, conducting, and publishing an interview provides an amazing opportunity to build a working relationship with an Influencer that could take your blog to the next level. And just in case you need reminding – on the road to blogging success, relationships come first, great content comes second. Here are the key steps in putting together an Influencer Interview. You need to get on their radar. Believe it or not, some bloggers try to interview experts without doing any background research. As I said, it’s a good idea to give the Influencer a choice for method of interview—it’s more likely they’ll agree to the interview if they feel they have some control. However, the best option by far is to conduct the interview by Skype or phone. Because a Skype or phone conversation allows you to ask unanticipated follow-up questions. And these follow up questions produce the real gems in an interview. How did you start off in [their niche or field of expertise]? What were the main challenges you faced when you were starting out? What are the biggest hurdles that your readers’ face and how do you help them to overcome these problems? Who do you admire most in your field? What has been your single biggest success? What’s the single most important piece of advice you would give to someone starting off in [their niche, area of expertise]? Always introduce your subject—never ask them to introduce themselves. Anecdotes are the lifeblood of interviews. Try to get your interviewee to share an anecdote or two. Parroting can be annoying in normal conversation. But in an interview, it opens doors. Ask questions that can’t be answered with a ‘Yes’ or a ‘No’. These are questions beginning with ‘What’, ‘When’, ‘How’, and ‘Why’. What were you doing before you started in [SEO, marketing, copywriting etc]? How long did it take to turn your idea into a viable business? Want to know the best part of interview articles? The subject you interviewed is going to share your article amongst their followers. And it’s more than likely they have a large audience. So let the subject know as soon as the article is live and ask them to share it. The Internet is literally swimming in content. 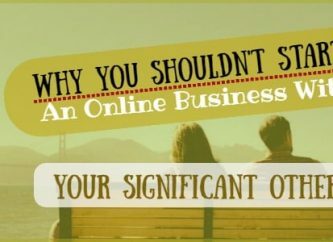 So it’s no surprise that in the blogosphere connections are more important than content. Of course, you need to produce great content. But without the right connections, your content will never get noticed. When you hang out with Influencers, some of their authority rubs off on you. It’s unconscious, it’s just what happens. In the minds of your readers, the very fact that these big names have appeared in your roundup, in your top list, or in your interviews adds to your authority. Produce these three types of articles and you’ll get much more exposure for your content than you could ever get on your own. And you’ll build traffic, backlinks, and authority. If you have experiences with Expert Roundups, Top Lists, or Influencer Interviews, I’d love to hear from you in the comments below.